“I think it’s encephalitis,” she tells me. “Because it hurts back here, in my neck.” The woman motions to the back of her hairline, which is grayed and dry. Susan is seventy years old and called 911 today for a runny nose and some neck pain. She’s been sick for several days but hasn’t seen a doctor. She lives in a “single room occupancy” government-assistance high rise downtown, where she shares a small room with a younger man she tells me is her friend. We’re in a crowded coastal city, with ancient tenement-style hotels crammed next to new money high rises, condos, and row houses. A tipsy young couple might walk an extra few blocks to avoid a neighborhood like Susan’s. She wears an oversized orange sweater and unravels one sleeve with her thumbs as we talk. The sweater isn’t as dirty as a lot of clothes worn by the people we treat, but it’s not clean. I take Susan’s vital signs and hook her up to the cardiac monitor. I turn the heat up in the ambulance. Susan is like most of my patients: lonely, destitute, and nursing a minor medical complaint. I’ve worked on a 911 ambulance for five years in three different counties. Urban and rural, rich and poor, wet and dry. My job isn’t really what people think it is. On a TV screen, paramedics are always rushing to try to save a woman crushed under a building, a man bleeding out, or a baby taking its last breath. There are a lot of sirens, there is a lot of shouting, an occasional goofy drunk for comic relief, but the bulk of the job is invariably depicted as an adrenaline rush. Strangers’ eyes usually widen when I tell them what I do for a living. The truth of my work is both less and more interesting. A paramedic today exists in a poorly defined gray area, some combination of field doctor, social worker, and street sweeper. We answer many of our calls without sirens at all, and sit with people nursing complicated problems that only distantly relate to actual medicine. I recently came across a startlingly truthful depiction of the soul of EMS in a book that seemed to have nothing to do with emergencies at all. In the New York Times bestseller Evicted, Matthew Desmond follows eight families swept up in the eviction process in Milwaukee, Wisconsin. 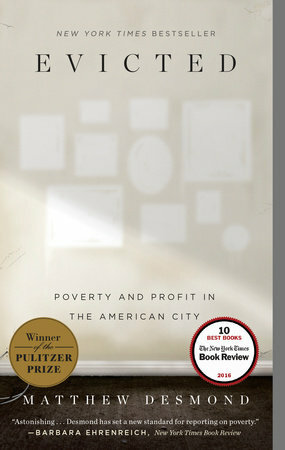 This book about economics and housing quickly turns into a gut-wrenching story of American poverty. About three pages in I realized, Oh, this book is about my job. Desmond writes about Arlene, a single mother of five or six kids. She lives off welfare because the money seems steadier than any job. Her youngest son has asthma and she keeps falling behind with his medications. I know before Desmond tells me that she often calls 911 for his asthma attacks. He gets sick a lot and, with no primary care doctor, they take him in to the ER. I know. I’ve run that call. The history of housing, of the neighborhoods that people live in and why they live there, is the story of American poverty. As a street medic, I’m never going to see most patients’ lab values. But I’ll see the inside of their bedroom, and their neighbors’ bedrooms. I’ll see the photos stacked in the dark corner of a closet before I’ll ever see a chest x-ray. I climb my bags up three flights of stairs, past potted plants, framed certificates, and family photos. I know which houses have illegal back units, which have meth labs, which have a beautiful rooftop deck. I look in the fridge for insulin. A patient directs me into her closet to pick out a jacket to wear to the emergency room; she doesn’t like the yellow one, grab the blue behind it. A Vietnam infantry hat falls as I reach for the hanger. She tells me to put it back, it was her husband’s once. The edges of the hat are worn thin. We see molded kitchens, rotted attics. I leave food out for pets, switch off lights, turn off the stove under a pot of oxtails. Once I read half a poem left in a dead woman’s typewriter. Ambulance services, at their core, are about transportation. We do a lot of assessment and a little bit of intervention, but our main function is to get people from wherever they are over to the hospital. We call it the “scene.” What was the scene like? Is the scene safe? Are we at a house, a clinic, an alleyway behind a row of dumpsters? In a normal month I run on, roughly, between seventy and one hundred patients. Usually two or three of those are lights and sirens, step-on-the-gas, “Johnny, get the paddles”-type emergencies. Your car wrecks, your heart attacks. The rest are people like Susan: poor, homeless, old, drunk—people who have stepped away from or been kicked out of society and don’t know where else to turn for help. I usually see each patient for about an hour, street to hospital. We have some frequent flyers, but we only catch them on their bad days. When we don’t see someone for a while it usually means they either sobered up, went to jail, or died. We arrive at the crisis point of a story and we almost never witness its resolution. We almost never see a story resolve. The night after I finish Desmond’s book I write down all my calls for the shift. I work downtown, from 4:30 p.m. to 4:30 a.m. That night’s calls include Tag, a forty-one-year-old at a free clinic who’s had pain in his ribs for about a month. After Tag is Ronnie, a fifty-eight-year-old male from a veteran’s housing assistance shelter. He’s having a psych episode and a runny nose, in that order. He talks quickly, mostly makes sense, but veers into paranoia if you let him steer the conversation too long. His nose has been running for a week and his neighbor stole his pants and painted them a different color. These pants? I point to the jeans he’s wearing. He’s not sure. He says the guy crawls under his door every night and does it and then crawls back out. We give him some Kleenex and take him to the VA.
There’s a drunk homeless man with a cut on his head, called in by a tourist who didn’t even stop her car, just reached for a cell phone and drove on by. Then Susan, with her neck pain and her orange sweater. A ninety-one-year-old Russian woman having an asthma episode which is more or less resolved when we show up. Her son is worried, though: she lives alone, he can’t stay the night, and they can’t afford a home care nurse to stay with her. All of these patients face serious issues with housing, food, basic life skills. The 911 call is less about an emergency and more about an inability to provide for themselves. A lack of access to basic human needs like food, water, and hygiene will all eventually become medical if ignored for long enough. Bare fridges lead to malnutrition, broken plumbing creates infection. Addiction becomes overdose. Some folks call us hoping for a trip to the ER when they just don’t want to spend another night alone. She tells me she has some Haldol left, but she doesn’t always take that one because she doesn’t like it. Her knees rock back and forth on the gurney, which is probably a side effect from the drug. Patients on life-long psych meds are often a little twitchy. She tells me the blood pressure cuff feels too tight. She’s been receiving disability since she was twenty-four or twenty-five for hallucinations. She was living down South back then. She spent a year in Tulsa, two years in Sacramento. She bounces around. She gets disability payments and welfare sometimes. She’s been sharing the room with Marcos for several years. I look her up on our computer system; she’s been transported by us four times this month. She says she usually wheelchairs down to Safeway but it’s been cold this week. As we’re pulling away from her hotel I ask her, if she has been sick all week, what it was that changed tonight to make her call 911? In poor communities, stable access to medicine is rare. Frequent moves mean frequent changes in insurance, Medicare eligibility, and transportation ability to a new doctor. When the food runs out, when the housing runs out, when the relationships break, we are the last resource. We have a regular patient in my city named Leena. Her temperament is that of an underfed child. She flips a switch in an instant between happy and angry, laughing and crying, cooperative or spitting at us. She calls us in the middle of the night because she ran out of vodka or her bus driver looked at her the wrong way. She likes to describe her sexual escapades in uncomfortable detail and has thrown punches at paramedics with little warning. I wish I could be the person who got these patients into a long-term care facility, who got them therapy, who single-handedly lifted them from the darkness. But all I can do is put them on the gurney and take them back to the hospital. I was trained in school to react in a matter of seconds to life-or-death situations. Open the airway, stop the bleeding. Save the heart that hangs precariously on the edge of death, reach out and grasp the last slim chance at life. Emergencies. But, for someone like Leena, being tired and alone is an emergency. Her life has gotten so far outside of her control that she can’t see more than an hour from now. And in the next hour, the sun’s going to set and the night fog’s coming in. Instead of leaving her on the street, I try to talk some sense into her, and give her a blanket and a ride back to the ER. Maybe this time something will change. Three hours later Leena calls again, about a block away from the ER where we left her. A different crew runs on her this time. Overdoses always go up on the first and fifteenth. I know more about social security checks than I do about cancer for sure. And people who have run out of resources, who are lost and scared and alone, will always vastly outnumber people who happen to be having a stroke or a heart attack. There’s just more of them. So as long as 911 remains free, and fast, the bulk of our work will never be about rapid transport. In Evicted, Desmond writes, “There are two ways to dehumanize: the first is to strip people of all virtue; the second is to cleanse them of all sin.” Desmond writes about his people, my people, with compassion and detail. He reminds me of their good days, their happy moments in between the rough patches. He fills in the story of that month when we didn’t hear from Leena, when she was well fed and staying with her auntie up north somewhere. It’s good for me to see that part of the story. To remember the human behind the call. When we drop Susan at the emergency room, my partner and I both compliment her sweater. We say it looks nice on her, and cozy in the winter air. She smiles broadly. “I’ve had it for so many years,” she says. “It’s my favorite.” She pulls at the sleeves and sets her chin in the knitted bundle of cloth. I tuck her blanket in and wish her the best. I hope she gets to feeling better, gets her prescriptions sorted, and stays out of the hospital for a while. In other words, I hope I never see her again. Elizabeth Rosen has worked as an EMT and then Paramedic since 2007. She drinks three coffees a day, loves the airhorn, and plays music in the rig as loud as she can get away with. She once tried to park the ambulance facing up a dirt hill to take a nap and got it so stuck that they had to call for a tow truck. With his unconventional take on children’s television, Mr. Rogers helped redefine the male role model.